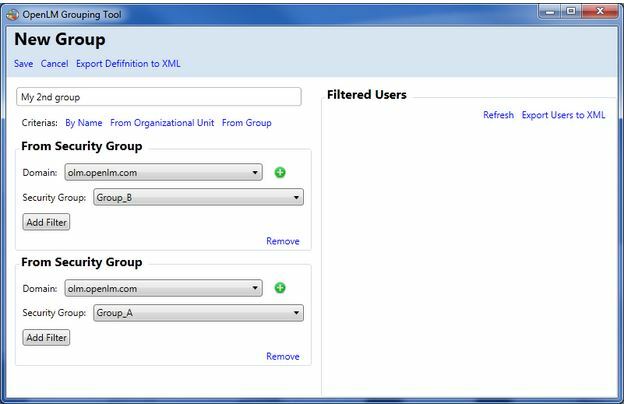 The Group Reporting Interface facilitates a flexible method to define groups of users based on the active directory database of the organization, and query the OpenLM server to get license usage reports for these groups. 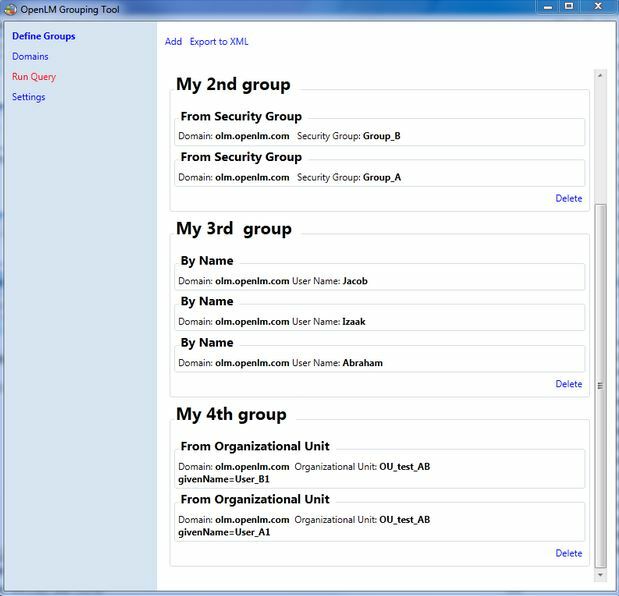 The Group Reporting Interface serves as an extension to the groups and projects capabilities on the “Active Directory” tab in the OpenLM server configuration tool. It demonstrates enhanced flexibility, and usage history logging. 1. 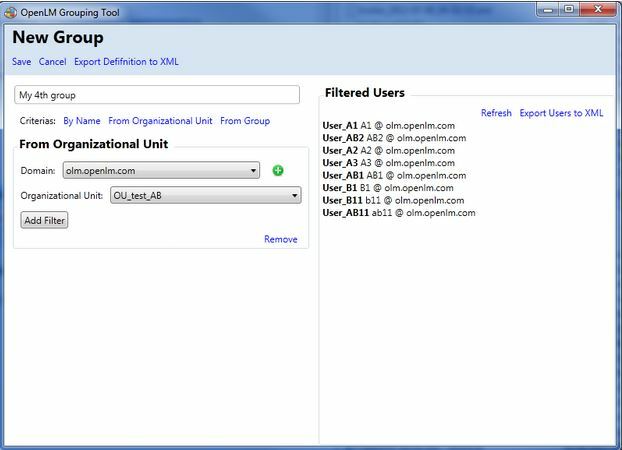 Throughout the OpenLM Grouping Tool, the user may click the Cancel link in order to return to the previously selected window. 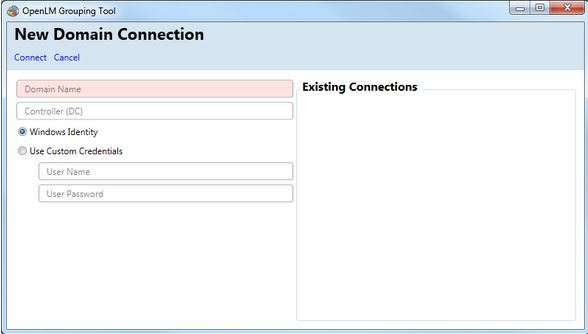 Specifically in the Settings window, clicking Cancel would lead the user back to the OpenLM Grouping Tool main window. 2. 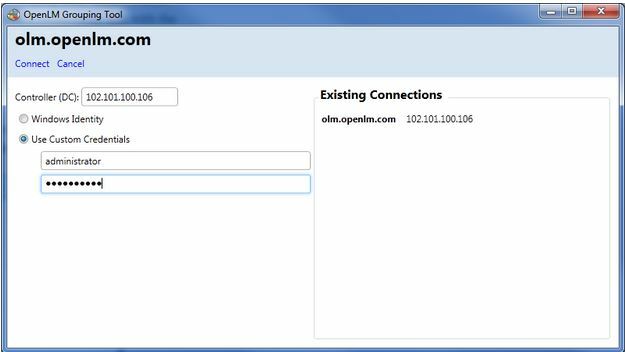 Click the Check Connectivity link in order to perform a connectivity test with the OpenLM server. 1. Click the Domains tab. 2. Click Add, and type in the available Active Directory domains in the organization. 3. Click Connect to test and save the added connection. 1. Select the Define Groups tab, and click Add. The New Group dialog window appears. 2. Provide a name to the new group in the pink background text box. 3. Select a criterion for the required filtered selection of the organization’s data, e.g. : “From Organizational Unit”. 4. Select a Domain name from the Domain drop down list. If no such domain exists, click the green + symbol adjacent to the Domain drop down list. The New Domain Connection window appears, and the user is prompted to present a new domain(see further below). 5. Click Refresh in the Filtered Users area. The users that fit the filter conditions are shown. 6. Filters may be applied to this pool of users. These filters use AND logic, i.e. – all conditions must comply in order for a user to pass. In order to create an OR condition, click any criteria again (e.g. “From Organizational Unit”). Another frame would consequently open, to apply further OR logic. See the screenshot below for clarification. 8. Click Save, in order to save the new group. 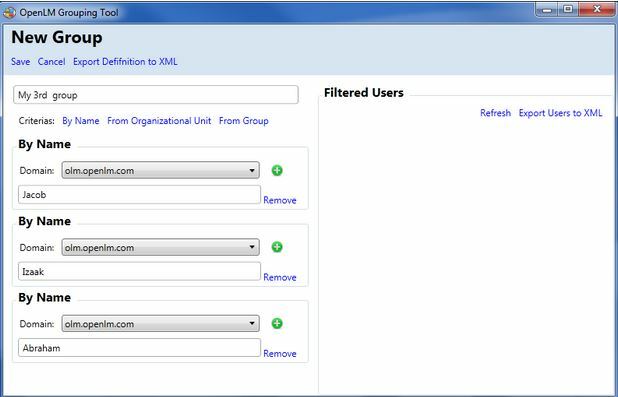 As stated above in Defining Groups-Organizational Units section (see item #4), the user may require to add a new group domain. In order to do so, click the green + symbol adjacent to the Domain drop down list. The New Domain Connection form appears. 1. Type in the domain name in the upper Domain Name text box (e.g. : olm.openlm.com). 3. Select whether to use a Windows Identity, or manually insert Custom Credentials. If the latter is chosen, provide a User name and Password in the designated text boxes. 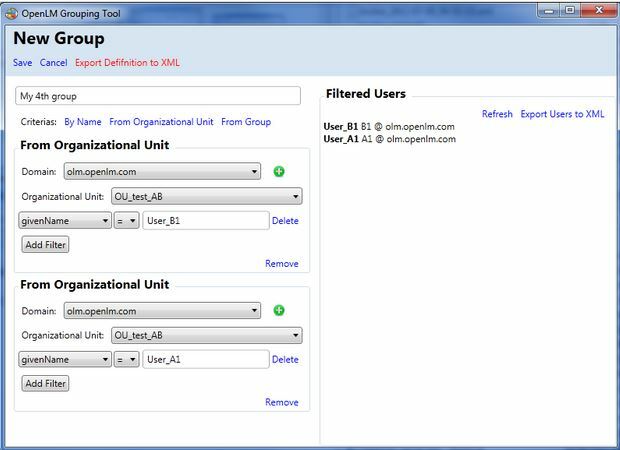 The Group reporting Interface tool queries the OpenLM Server for the total license usage of all the users in the predefined groups. This report can only be obtained after configuring Settings, Domains and Groups, as elaborated above. 1. 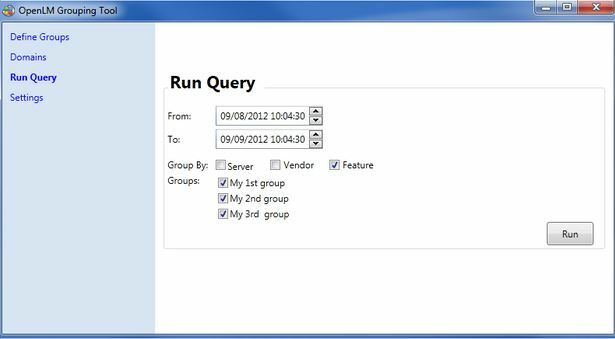 Click the Run Query tab. 2. Select the date interval for the query occurrence. 3. Check the required groups check boxes. 4. Click Server, Vendor, and/or Feature in order to see those items in the report. 5. Click the Run to process the query. The query’s output is a summary report of the total license usage for each of the selected groups.